Haydel's has created the ultimate locator call. Roosters crowing in the early morning will often times cause turkeys to gobble. While being extremely loud, the RR-98 is a very natural sound. Especially useful in locating distant toms. ALSO DOUBLE AS PILEATED WOODPECKER, COYOTE HOWL, AS WELL AS PEACOCK. Clucks and yelps of a hen turkey can also be imitated. 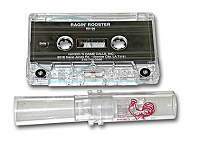 Comes with free instruction tape. Produces high-pitched woodpecker & peacock calls that shock a bird into gobbling. 3-in-1 Locator Call featuring coyote, peacock, and woodpecker. Easy-To-Use call gives you options while locating turkeys. The shrill cry of the peacock is well known for driving gobblers crazy. 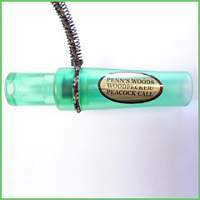 The peacock call is also capable of producing a pileated woodpecker, perfect for Eastern U.S. hunters and high-pitched coyote, perfect for areas of the West - including Texas.